Brown Besier, ~ 2004, WormBoss meeting, Attwood VIC. Phot0: SL. 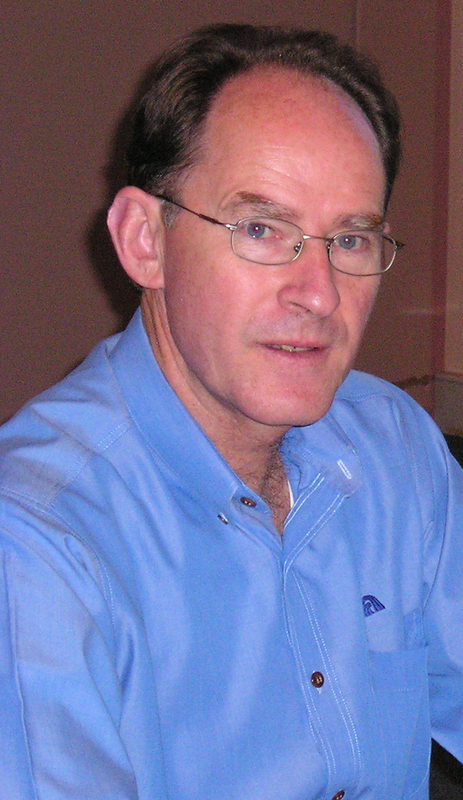 Well-known and highly respected veterinary parasitologist, Dr RB (‘Brown’) Besier retires in July (on Bastille Day) from the Department of Agriculture and Food, Western Australia (DAFWA). A Principal Veterinary Parasitologist, Brown has been based for some years in the lab facilities at Albany, WA, from which he ranges far and wide. After graduating from the University of Queensland veterinary school, RBB spent his formative years as a new veterinary graduate in various parts of WA including a stint in the wilds of the Kimberley region of northern WA. In time, after heading south, he went through a period of intensive training in veterinary parasitology. Brown did his PhD on Haemonchus (barber’s pole worm). Interestingly, he is now involved in Barbervax, a world first (barbers’ pole) worm vaccine that is produced in Albany but hails from Scotland. Brown of course has been up to his eyeballs in all things parasitological and is known to all who know much about worms and are passingly familiar with the literature. (RBB has has authored nearly 200 scientific publications). In addition to serving on the executive of multiple professional groups, both national and local, Brown also played an important role in WormBoss, which paved the way for its sibs, LiceBoss and FlyBoss, the three of which make up ‘ParaBoss‘. While Arthur Le Feuvre in particular championed WormBoss from embryonic stages through to early adulthood, Brown at the time led parasitology programs in the Sheep CRC, (which he did for 12 years) and played a vital role in the early and later stages of the WormBoss story. There were others of course – it has always been a team effort – not least the likes of Lewis Kahn (Executive Officer) and Deb Maxwell (Operations Manager) who, with assistance from the ParaBoss Technical Committee, currently guide and nurture ParaBoss (funded at present by MLA and AWI). Really, Brown is neither retiring (activity- or personality-wise), nor is he going walkabout. He will still be very active, setting up his new venture ‘Brown Besier Parasitology’. RBB will still be involved with Barbervax (local management) and ParaBoss, and also his external (adjunct) role (Adjunct Professor) with Murdoch University. I believe he is theoretically interested in golf, but time seems to be an issue. Not an issue (in no particular order) is finding time to enjoy a good red, his family, friends and his beloved standard poodle. With heart-felt thanks to Brown, on personal and professional levels, and best wishes for his future. ‘Team Besier?’. 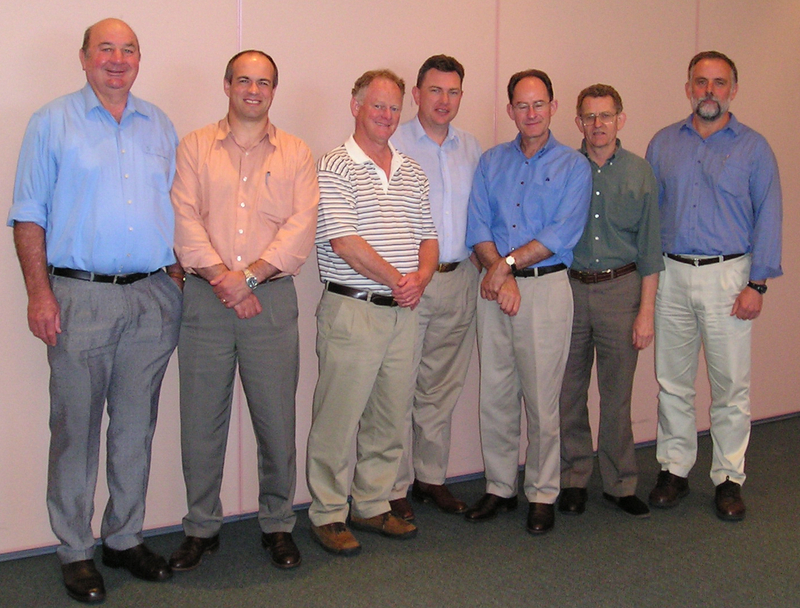 L-R: Arthur Le Feuvre, Scott Williams, Ian Carmichael, Rob Woodgate, Brown Besier, Noel Campbell, Stephen Love. WormBoss Team meeting ~ 2004. (Nicknames withheld). ‘A smattering of positive liver fluke counts and also some high ‘strongyle’ worm egg counts, many of these dominated by Haemonchus (barber’s pole worm(BPW)). I think a WormTest from Gundagai takes the prize with a WormTest (usually done on 10 samples) returning an average worm egg count (WEC) of ~ 11 000 epgs per gram. Usually you can bet the highest WEC in a WormTest involving 10 individual sheep (sometimes batching of samples is done), will be 2-3 times the average. In this case the highest was about 20 000. But, high worm egg counts in winter? We have been over this before. There are a number of factors, maybe three main factors. I’ll pick on just one: are the drenches used on this farm effective? OK, I’ll pretend I am a betting man and say that there is a 90% chance the farmer in this case doesn’t have good, recent, objective data on how effective the drenches are on their farm. This is not unusual. OK, one more comment: larvae newly produced in autumn (when it was still warm enough for development of eggs, of BPW for example), will survive over winter, despite frosts, albeit in declining numbers. NSW DPI’s Lambex coordinator / Lambex committee member is Tracy Lamb (yes, she has heard all the jokes) located at Cowra. Dever ML, Kahn LP, Doyle EK, 2015.Removal of tapeworm (Moniezia spp.) did not increase growth rates of meat-breed lambs in the Northern Tablelands of NSW. ‘MLA and AWI’s Wool and Sheepmeat survey is now open until the end of the month. It can be accessed by clicking the link below. The ensemble of enlarged longitudinal or oblique cuticular ridges which serve to hold the Nematodes in place on the gut wall,found in numerous Trichostrongylids (Anderson 1974).